No sense in breaking it down, but there will be some speculation to this about the move. THR says the move was made so that the entire world can share the experience together. Normally, a big blockbuster tentpole like this would open overseas first, then here in the states. Scheduling it around the first week of May is made because of competitive reasons. Also, moving up the date ensures that no spoilers leak out, which would ruin the viewing experience for North American audiences. While the summer movie season will also start a lot earlier than expected, the move could also give the film some room to breath when Solo: A Star Wars Story opens just a few short weeks later on May 25, 2018. The sequel will unite the Avengers, Doctor Strange, and the Guardians of the Galaxy together as they face the Mad Titan himself, Thanos (Josh Brolin), who is actively seeking out the six colorful and all-powerful Infinity Stones, which when placed inside a gauntlet, could bring about intergalactic devastation. 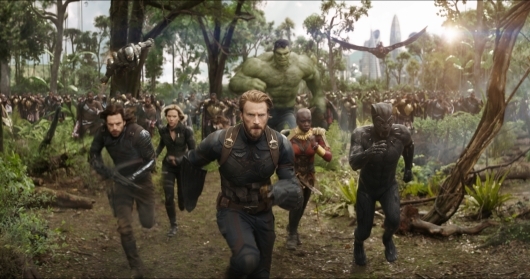 Avengers: Infinity War stars too many actors and actresses to place in this sentence alone. But you can expect to see Downey Jr., Brolin, Chris Evans, Chadwick Boseman, Danai Gurira, Scarlett Johansson, Tom Holland, Chris Pratt, Zoe Saldana, Benedict Cumberbatch, Benedict Wong, and so much more. It’s directed by Anthony Russo and Joe Russo, using a script written by Christopher Markus and Stephen McFeely. Click right here for more on the film, including the first trailer.